How Often Do You Have Meaningful Spiritual Conversations? After Jesus’s death and him overcoming death, he appears on the street headed to the city of Emmaus, traveling with two of his followers. But they don’t recognize him. He talks to them about God, the Scriptures, and faith. When they eventually realize who he is, he disappears. Then they recall how their hearts burned when he talked to them (Luke 24:13-32). They had a meaningful spiritual conversation. Yes, any exchange we might have with God would be a meaningful spiritual conversation, but we can have meaningful spiritual conversations with each other too. 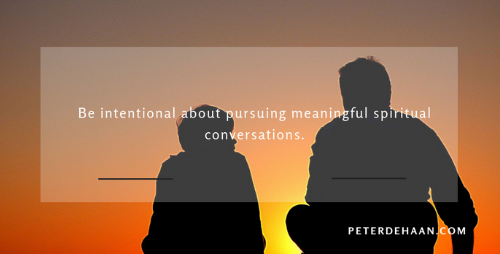 What is a Meaningful Spiritual Conversation? It’s hard to define what makes a conversation both spiritual and meaningful. Yet when we encounter one, we know it. This is a result of intentional action to make our words count, celebrating Jesus and inspiring one another. It’s bypassing those easy comments about family, work, sports, and weather. It’s skipping trivial exchanges to embrace a dialogue of purpose. It takes work to accomplish, but it’s worth the effort. Here are some of the results that occur when we have meaningful spiritual conversations. Talking with one another connects us. Having insignificant discussions results in insignificant connections. Having deep conversations results in deep connections. May we always be intentional with our words. Paul writes that we are to encourage one another (2 Corinthians 13:11, 1 Thessalonians 4:18, and 1 Thessalonians 5:11, as well as Hebrews 3:13). We encourage each other through our words. For our encouragement to have the deepest impact, it must be both meaningful and spiritual. These conversations build us up in our faith and inspire us as we walk with Jesus. Last, these intentional conversations allow us to worship God. In the Bible, John tells us to worship God in spirit and in truth (John 4:24). I’ll likely spend the rest of my life trying to unpack all that this entails, but I’m quite sure that one aspect of worshiping God in spirit and truth occurs when we have conversations with others of a meaningful, spiritual nature. May we never lose sight of this. May we seek meaningful spiritual conversations with others every day.